Choose from our complete range of every available filter spare and accessory for every model of AquaNano aquarium, including filter media, cartridges and pads, filter pumps, heaters, lighting and more. We also have a fantastic range of new Inspire Cabinets available to suit all AquaNano models. Find all the spares and filtration spares and components you need to keep your AquaNano 22 aquarium in tip top condition. 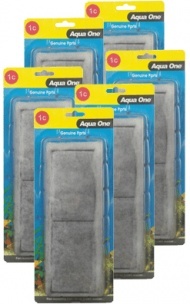 Choose from our Complete Filter Media Kits and Multipacks which provide great value for the concientious fishkeeper or why not consider one of Aqua One's elegant Inspire Cabinets to enhance your setup. The little Aqua Nano 25 holds just 12 litres of water but makes a great aquatic environment for small fish or shrimps. Keep your Aqua Nano 25 running well and looking good with all original Aqua One spares. Middle of the range and sporting a 22 litre capacity the Aqua Nano 30 is still only a foot long yet great fun for small fish and plants. Make sure it looks good in the long term with regular maintenance and filter changes. Built in, high quality filtration is the cornerstone of this great looking purpose-built marine aquarium. 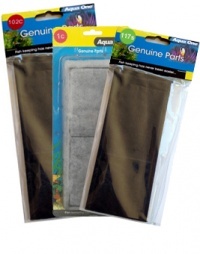 Keep your AquaNano 36 aquarium in top condition with our full range of genuine Aqua One products including filtration, aeration, heating and lighting items. The largest Aqua Nano shows that small can be surprisingly capable with great filtration and a useful water capacity of 55 litres. Its still a small set up for small fish but offers very elegant proportions. Remember to change your PL lighting tube every six months and service the filtration pump every year. The brand new 100L Aqua Nano 60 shows is not only a great looking tank, it is also incredibly easy to maintain, thanks to it's great built in filtration. 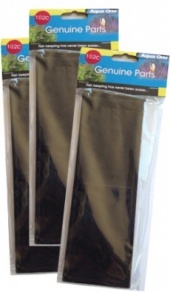 Here at Aquarium Parts we stock the complete range of spares and accessories including biological and chemical filtration, heating, lighting and aquarium decor.